At 6 months, your child should be sleeping undisturbed throughout the entire night. At this age, children should be placed in their cribs for bedtime groggy but definitely awake. Children need to learn to calm themselves down and put themselves to sleep. You cannot continue to rock or nurse your child to sleep as it will soon cause problems. 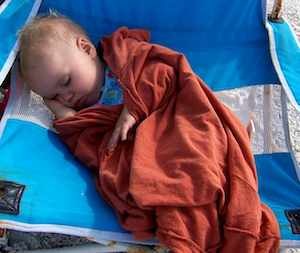 The phrase “slept like a baby” holds some truth as babies typically fall asleep and then wake up. Adults sleep in “sleep cycles” that average four hours. Every four hours the average adult wakes, fluffs their pillow, changes position and falls back to sleep. Adult sleep patterns typically develop around this age. Many children who are soothed to sleep begin to wake at this age in the middle of the night. They want to go back to sleep and cry to ask their parents to rock or feed them back to sleep. Sickness, travel and visitors often cause sleep problems for children who were “sleeping well”. During these times, we as parents often go to the child when we normally would not. Often parents have to “work” to get their child back into good sleeping habits.